Alliance Machinery and Equipment Appraisals has been running a pretty successful Google AdWords campaign over the past year. They have been getting clicks, but want to lower their bounce rate and get more leads to improve their ROI. Valley WDC showed them how to refine their account settings and recommended a new landing page focused on getting more conversions. We’re going to focus on that landing page here. The marketing message echos the ad(s) that leads to the page. All distractions from completing the desired action have been removed (no main navigation, no pointless text, etc). 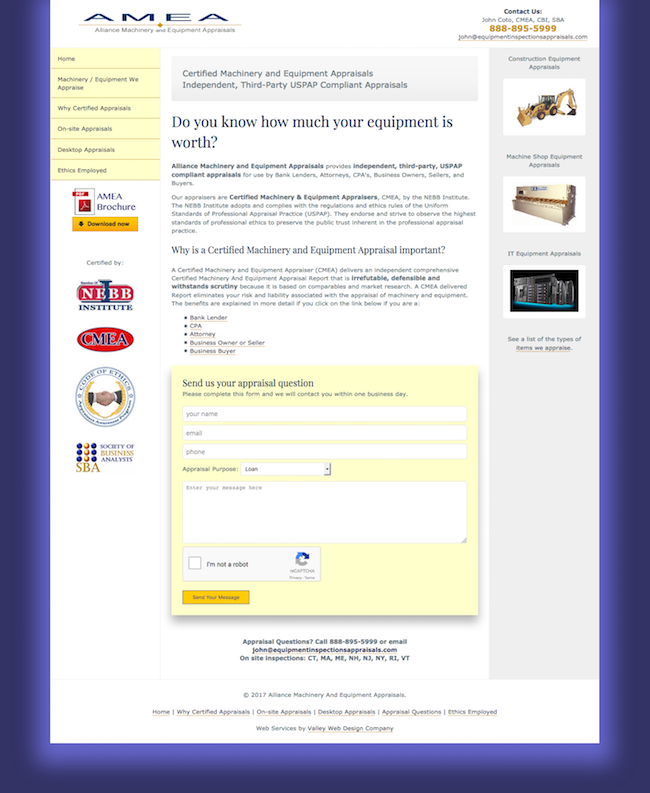 Search box helps people find out if the company appraises the type of equipment they have. Clear calls to action (call us or fill out the form). Sub-headings echo the most frequently asked questions. Slideshow re-enforces the types of equipment they appraise. Industry logos lend to credibility. A landing page should provide enough information to prompt the user to complete the call to action. Yet, it should avoid presenting too much information to avoid over-loading the audience. Could your landing pages be better? Call us for more information!